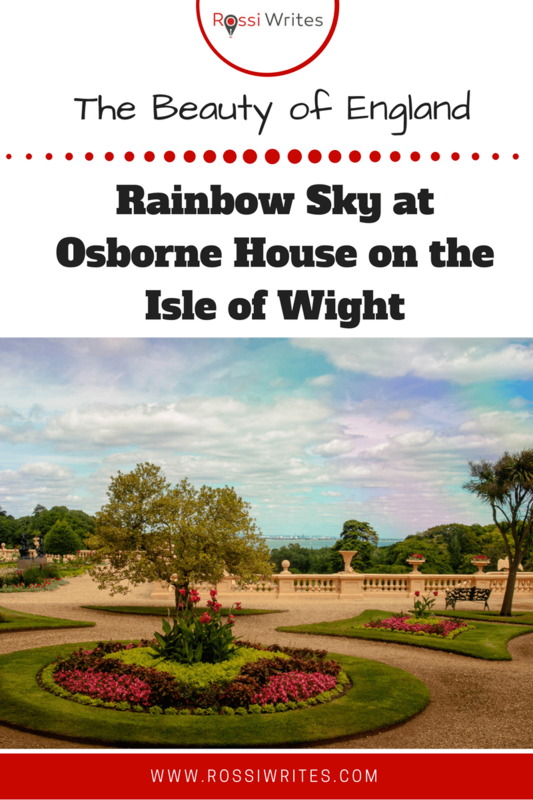 I was very lucky to take this picture of a rainbow sky at Osborne House on the Isle of Wight this summer. I took it through the glass window of one of the many lavish rooms which overlook the splendid garden of the house. As luck would have it, the area of the glass through which my lens managed to look, seemed to have been covered with a thin layer of a substance (something used to clean the windows perhaps) and this refracted the rays of sun producing a spectacular rainbow sky. Built for the newly wedded Queen Victoria and Prince Albert, the house became their happy love nest to which they would retreat every year of their marriage with their ever growing number of kids in tow. at the house which reminded her of how happy she had been with her beloved husband. In 1901 the Queen died at Osborne House. Nowadays, Osborne House is open for visits and it is well worth it of spending at least half a day there when you are on the beautiful Isle of Wight. This summer marked my very first visit to the house and I hope to be able to return there at least once more. to live in. With its gorgeous gardens and sweeping sea views, it fills the soul with joy. Osborne House deserves a detailed post all about it and, I promise, this will happen rather sooner than later. For now, I just wanted to share with you this picture of the rainbow sky above it, as, I feel, it captures well the spirit of the house.